“Mad” Mike Hughes successfully launches his rocket on March 24, 2018. 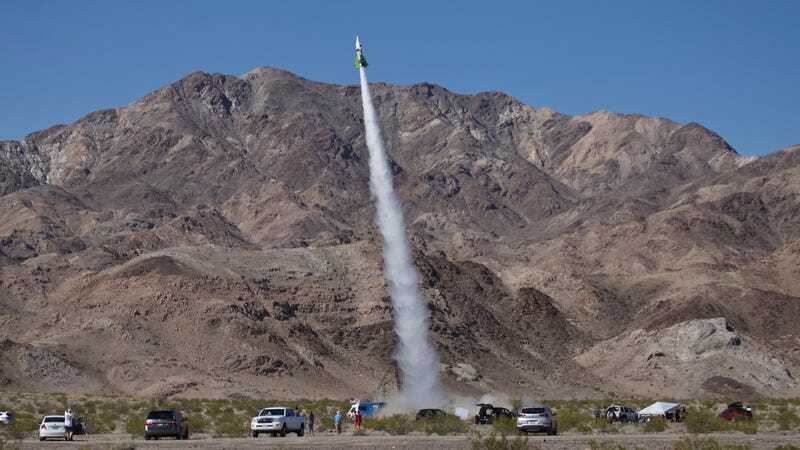 After the failure of two previous attempts to launch his steam-powered rocket with “RESEARCH FLAT EARTH” emblazoned on the side—first due to meddling government bureaucrats and then due to unspecified technical problems—Hughes finally managed to take off on Saturday from the Mojave Desert ghost town of Amboy, California. Video of the launch posted by AP freelancer Matt Hartman captured the moment the rocket took off, which seemed to take onlookers by surprise, including a nearby group of boys who appeared to be idly throwing rocks into a bigger pile of rocks. After the Bureau of Land Management nixed his first attempt for a flight path that would have taken him over public land, Hughes modified his rocket to use an improvised vertical launch platform. Per the AP, helper Waldo Stakes said that they were only able to get the steam rocket to 340 psi instead of the planned 350 psi, but went ahead with the launch anyway because Hughes wanted to avoid yet another failed attempt and dispel rumors he wasn’t actually on board a previous rocket he managed to launch in 2014. Stakes estimated the speed at 350 mph. Hughes told the AP that outside of an aching back, he was fine and felt “relieved” the rocket launch was over. Whatever calculations Hughes, who does not “believe in science,” performed are not a matter of public record. But the 350 mph estimate, accurate or not, is definitely fast enough to secure bragging rights. The AP noted the triumphant rocketeer’s future plans include building a “Rockoon,” which sounds like an air-launched rocket that involves a balloon instead of a plane and is apparently intended to get him high enough into the air to test his Flat Earth theory (68 miles, well above the breathable atmosphere and the Armstrong Limit where all bodily fluids would boil away in an unpressurized environment). Also he’s gonna run for governor, because sure, whatever.